The BMW M5 Competition Edition celebrates the production life of the F10-generation M5, with just 200 M5 Competition Editions offered for sale worldwide. Both power and torque have been increased, making the Competition Edition one of the most potent cars ever produced by BMW. The peak power output now stands at 600hp, while the torque output reaches a maximum of 700Nm, equating to a 0-62mph time of just 3.9 seconds. The standard fitment of the Competition Package, with its even more sportingly focused chassis, ensures the additional power is put to effective use. The BMW M5 Competition Edition is readily identifiable by the fitment of carbon fibre BMW M Performance Parts and a black kidney grille. The 20-inch alloy wheels are painted Jet Black, and just two exterior colours are available: Mineral White and Carbon Black. Inside, occupants benefit from Full Black Merino leather upholstery with Opal White contrast stitching, along with further selected details including the unique “1/200” engraving to the interior trim. Even more power for the BMW M masterpiece. 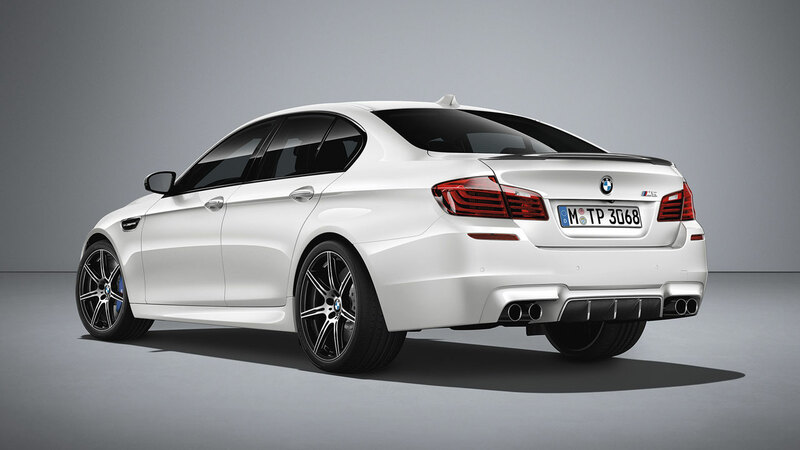 The BMW M5 Competition Edition uses an even more powerful version of the twin-turbo V8 found in the standard BMW M5. While retaining the M TwinPower Turbo technology, twin-scroll turbochargers, high-precision direct fuel injection, VALVETRONIC variable valve control and the cross-bank exhaust manifold of the standard car, the Competition Edition runs more boost courtesy of a recalibrated ECU. Maximum power is up from 560hp to 600hp, with the peak torque of the V8 rising from 680Nm to 700Nm. As a result, the M5 Competition Edition can accelerate from 0-62mph in just 3.9 seconds, compared to 4.4 seconds for the standard car. Top speed is electronically limited to 155mph. With BMW’s seven-speed M Double Clutch Transmission Drivelogic and Efficient Dynamics technology, including engine Auto Start-Stop and Brake Energy Regeneration, the M5’s fuel consumption remains at an impressive 28.5mpg, given its extreme performance, while CO2 emissions are 231g/km. The M Competition Package fitted as standard for race-bred chassis dynamics. The renowned sporting qualities of the BMW M5 have been further honed on the Competition Edition with the adoption of the M Competition Package as standard equipment. This consists of stiffer responses from the springs and electronically controlled dampers, along with thicker anti-roll bars. The Active M electronically controlled multi-plate limited slip differential, which intervenes rapidly and precisely at an early stage to control wheelspin and keep the car stable, is re-calibrated for an even more sporty response. Once again, there are three Drive Control settings to choose from: Comfort for normal road use, Sport when a more dynamic driving style is preferred and Sport Plus for the most extreme driving, such as on a race track. Six-piston caliper brakes are mounted within 20-inch M Double-spoke 601M light alloy wheels, finished in high gloss Jet Black. The unmistakeable look of a pure sports saloon. The familiar yet powerful presence of the BMW M5 is further emphasised on the M5 Competition Edition thanks to the use of BMW M Performance Parts. These consist of a rear spoiler, rear diffuser and mirror caps all manufactured from carbon fibre, and a gloss black kidney grille. Just two colours are available – Mineral White and Carbon Black – with the ‘M5 Competition’ logo appearing on the famous side ‘gills’. 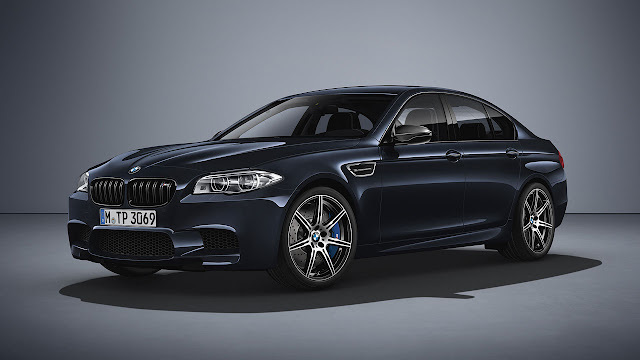 High level of standard specification and a driver-focused ambience for the ultimate M5. The BMW M5 Competition Edition comes with an extensive range of equipment including Adaptive LED headlights, Reversing Assist camera, powered bootlid operation, Comfort Access and sun protection glass. Inside, occupants benefit from front and rear heated seats, an electric rear sunblind and can experience supreme listening through the Bang & Olufsen Advanced audio system. The BMW M5 Competition Edition also benefits from full Black Merino leather upholstery with Opal White contrast stitching. Opal White is also used for the ‘M5’ logo that now appears on the head restraints of the M Sport multi-function seats, and for the piping of the anthracite floor mats. To accentuate the exclusivity of the car, the M Performance interior trim in carbon finish features the ‘M5 Competition’ logo along with the unique “1/200” designation. The BMW M5 Competition Edition is on sale now priced at £100,995 OTR.